Quality assurance signs, labels and tags. Part of our quality assurance (QA) and calibration range. 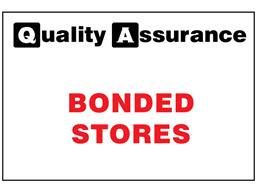 Bonded stores quality assurance sign. ZS1002 Size 400mm x 600mm. Material rigid plastic, foamex 3mm thickness.